When the figurative becomes literal: Bayer serves Orbán at the 2009 celebration of Fidesz’s foundation. Zsolt Bayer is a pro-Fidesz journalist who, along with Prime Minister Viktor Orbán, was one of 37 founding members of the party in 1988. Bayer served as one of the main organizers of the five pro-government Peace March demonstrations that took place in Budapest in 2012 and 2013. Although Bayer maintains no formal position in the Orbán government or Fidesz (though he did serve as the party’s press secretary for the first five years of its existence), his stated viewpoints can be regarded as an accurate reflection of the opinions of many party supporters and Orbán administration officials. Speaking about Bayer at the journalist’s 50th birthday party in February 2013, National Assembly Chairman László Kövér (another fellow founding member of Fidesz) said “We have lived together through good and bad, trouble and joy. Not one single time have we disavowed one another, nor shall we” (source in Hungarian). Below is an Orange Files translation of an editorial that Bayer published in the August 15, 2015 issue of the largest-circulation pro-government political daily, Magyar Hírlap (source in Hungarian). It began on Tuesday. On the Island of Kos, in Greece, where seven thousand intruders (betolakodó) arrived recently. The population of the Island is not quite thirty thousand. The horde poured down on these thirty thousand unfortunate Greeks. The life of the island became paralyzed. Already several months ago. The tourists fled, the hotels are empty, the population is angry and desperate. The horde knows nothing about this. It just continues to flow. 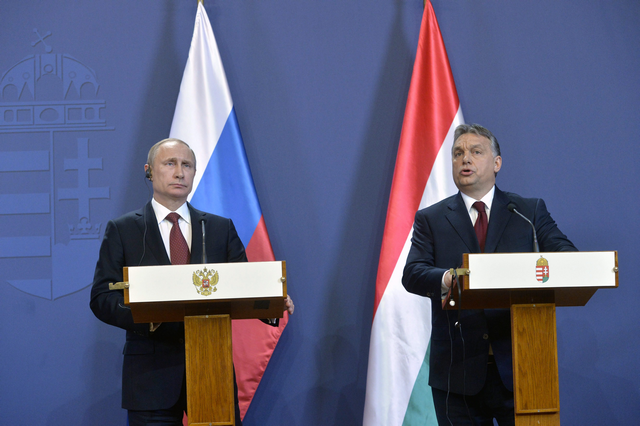 And it began on Tuesday. . . .
President Putin and Prime Minister Orbán at a joint press conference in Budapest on February 17, 2015 (photo: Hungarian News Agency). On February 17, 2015, President Vladimir Putin of Russia made an eight-hour official visit to Budapest. There hadn’t been so much portentous excitement among Hungarians surrounding the arrival of a foreign statesman to their country in a long time, perhaps even since the System Change. Not because Putin had any important business to do in Hungary, but merely because he is Putin―the larger-than-life and all-powerful leader of the newly revitalized and assertive Russia. President Putin initiated the visit to Hungary as a means of breaking his foreign isolation and showing the West that he was a welcome guest in the capital of a NATO and European Union member state (source in Hungarian). Both the Hungarian and Western media reported that Prime Minister Viktor Orbán, now trying to mend relations with Hungary’s NATO and EU allies, attempted to downplay Putin’s visit, which under the circumstances he found somewhat cumbersome and embarrassing (see New York Times article on the event). While this may be true, Orbán projected no discomfort as he and Putin held a joint press conference, dressed in nearly identical dark-blue suits, white shirts and burgundy ties, following their longer-than-expected two-hour talks. As expected, the press conference produced nothing of real importance―five minor agreements, perfunctory calls for peace in Ukraine, talk of a Russian-Turkish pipeline project in place of the discarded South Stream (source in Hungarian). In fact, the visit of the Russian president to Hungary, rather than a source of embarrassment for Prime Minister Orbán, provided him above all with the opportunity to show Western leaders something as well: that despite his efforts to improve relations with them, he has retained the independence of action necessary to host Putin, anathema in the West since his occupation of Crimea and proxy war against Ukraine, and to conduct an autonomous foreign policy in which national self-interest supersedes loyalty toward NATO and the European Union. And one thing that is certain: if Orbán is ever forced to abandon his “shuttlecock policy” (called hintapolitika―“swing policy”―in Hungarian) and choose between the West and Putin, he is much more likely to go with the latter, whose illiberal, authoritarian political outlook he shares. On the day of President Putin’s visit to Budapest, journalist Zsolt Bayer published an editorial in the pro-government newspaper Magyar Hírlap entitled “Letter to Vladimir Putin.” Bayer is one of the 37 founding members of Fidesz and many consider him to represent the true voice of the party and the current prime minister, the outspoken and often politically incorrect articulator of “things he would like to say, but can’t” (see In Defense of Illiberal Democracy). I travelled to those parts in 2005 and I wrote these lines as the introduction to a film and a book [referring to a brief account of a trip to Siberia]. And I did not think that I would once be so bold as to wait for your arrival. Because now you are right. This is the first and most important thing that we must say. You are right in almost everything. Most of all in that you did not let Russia perish. And be assured that we are also right. And also be aware that those who now rant against you and Russia here got along splendidly with the Soviet Union and approved of it when the Soviet Union trampled on us in ’56. This is how they lived for forty years. And they hated me precisely as much then, when I hated the Soviet Union, as they hate me now because I love Russia and think you are right. It is for this reason that they do not count at all, Mr. President. They refer to Europe, they scream Europe now when there is no Europe. When there still was a Europe and I, we, longed for Europe, then they hailed the Soviet Union. We are in phase-delay here, in the middle, compared to one another as well, and with regard to everything else too. Today Europe wants to be America, Mr. President. And this fate was intended for you as well. If your predecessor had remained, the hapless and weak-willed Yeltsin, then the foreign agents such as Khodorkovsky would have remained too and there would be no more Russia. Then there would be an immense colony, crippled in consumption, that contains Russia in its tracks. And maybe there would be flights between Kamchatka and Alaska every half hour, Mr. President. And just as the Americans bought Alaska from the czar, they would have bought all of Russia since then, but just for less. However, it would be said that you are a perfect democracy, a free country of the highest order. Because you know, Mr. President, the face of freedom has become so strange these days. You did not let Russia perish. You made it strong. You liked it Russian and kept it that way. You could have done nothing more or greater than this. One should naturally be cautious when attributing the words of one to the sentiments of others. However, aside from its characteristic obsequiousness, Bayer’s “Letter to Vladimir Putin”―which not incidentally makes frequent use of the personal pronoun “we”―may legitimately be considered an accurate reflection of the viewpoints of Prime Minister Orbán, Jobbik President Gábor Vona and most Fidesz, Christian Democratic People’s Party and Jobbik voters regarding Putin, Russia and the United States. Zsolt Bayer (left) receives a piece of cake from Viktor Orbán at Fidesz’s 21st birthday celebration in 2009. 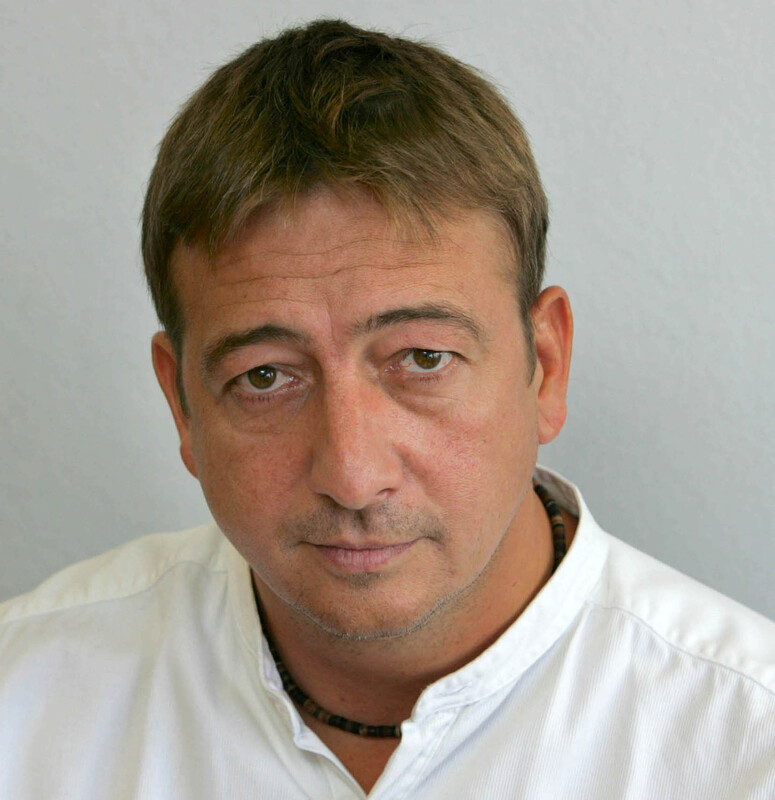 Zsolt Bayer is one of the most prominent pro-Fidesz journalists in Hungary. He is one of the 37 founding members of the party along with Viktor Orbán, László Kövér and other high-ranking officials in the country’s current political administration. Bayer is one of the main organizers of the pro-government Peace March demonstrations that have taken place in Budapest since 2012, walking in the vanguard of the massive processions each time. He is known for his unswerving pro-Fidesz partisanship and steadfast loyalty to Prime Minister Orbán as well as his caustic attacks on the West, domestic political opponents and, occasionally, Jews and Gypsies (see The Same Stench and Who Should Not Be?). Neither Orbán nor Fidesz have ever distanced themselves from Bayer’s fulminations. Speaking at Bayer’s 50th birthday celebration in February 2013, National Assembly Speaker Kövér said “We have lived together through good and bad, trouble and joy. Not one single time have we disavowed one another, nor shall we” (source in Hungarian). Below is an Orange Files translation of an editorial that Bayer wrote in defense of Prime Minister Orbán’s proclaimed illiberal democracy (see Proclamation of the Illiberal Hungarian State) published in the pro-government newspaper Magyar Hírlap on July 30, 2014 (source in Hungarian). Now then, here you go: The ridiculed failure of liberal democracy that you put together over the past 30 years is living its final hours. And everybody knows it besides you Pangloss masters of liberal democracy and free-market capitalism. By now it is only you who are having a fit and proclaiming that this is the best of all worlds. It is not that. The final symbol of free-market capitalism is Detroit. The onetime industrial center and bastion of American automobile manufacturing that has become a ghost down. Where besides the homeless only rubble and ruin have found a home. The middle of nowhere, the branch of nothing—the end of free-market capitalism, that is Detroit. The other symbol of free-market capitalism is the everyday tragedy of refugees arriving to the island of Lampedusa. As they drown on the shores of the Promised Land or get into Europe and become both part and cause of Europe’s ultimate decline. Capital is hauling work ever further to the east in the name of efficiency because the Earth still contains hundreds of millions who perform work at the conveyor for a bowl of rice for which the eastern European slaves have already begun to ask for “too much.” The work is going, the production is going, the capital is going east, while from the east and the south the labor force and the misery and the untreatable, unbearable foreignness is streaming to the west. A true danse macabre. But back in the day participants in this dance knew what the end was. However the miserable wretches reeling in today’s danse macabre all believe that they have discovered a solution for their lives. There is no solution. There isn’t anymore. Under the circumstances that the Pangloss masters imagine it, there isn’t anymore. This is what Viktor Orbán was talking about. That it isn’t going to continue this way. Yes. And the work-based society is the opposite of the parasitical society, not the elimination of liberal freedoms. Nobody has eliminated these here and has not even thought of doing so. Although you eliminate liberal freedoms and place them into parentheses any time you want. America has been spitting upon all of this for years. When it watches and conducts surveillance on not only its own citizens (this is also an atrocious crime! ), but on anybody in the world. This is the elimination of liberal freedoms in itself. When it holds people captive without trial and verdict amid indescribable conditions at Guantánamo, this is the elimination of liberal freedoms. But you never blather or throw a fit about this you cretins, paid panic-mongers, you unmitigated scoundrels. And at such times you keep quiet and explain: because we must fight against the terrorists. Oh, of course! It is always necessary to fight against somebody, this is the nature of dictatorship. This is how much has remained of freedom. Ugh. This is how much has remained and the putrefied educational system that has become a caricature of itself, where today a university degree is worth a high-school diploma fifty years ago. Or even less. And if somebody mentions this they are immediately accused of élitism. There is not one segment of western societies that has not become infected, unbearable, that hasn’t begun to rot and become condemned to destruction. And meanwhile you are horribly afraid of dictatorship, which there is not of course, but at least it’s necessary to paint it on the wall because how else are you going to sustain your own miserable, good-for-nothing and totally useless existences? I say it one more time via Canetti: “To the crowd in its nakedness everything seems the Bastille.” And if it doesn’t see it on its own, well then there is you to channel its thoughts in the suitable direction. At any cost, with lies of any magnitude, that doesn’t matter. Orbán says in Tusnád that the president of the United States was condemned for exceeding his authority, moreover this took place several times and everybody imagine what would happen if he WERE condemned for this reason, then how long COULD he remain in office. This means that, in fact, the United States is the true country without consequences, the showcase democracy, but if he were to exceed his authority and were condemned for it, then he would have to go right away. From this the scoundrels’ media army manufactured the following interpretation: with this Orbán wanted to say that, contrary to the president of the United States, he cannot be condemned. The cloaca called Index expounded upon this for a long while, there are more refined and vile swine than Népszabadság, they simply forged it into Orbán’s words so that the concept would be more salable. They cap off Orbán’s conditional mode (would condemn) with a can/may deverbal verbum derivative (could condemn) in order to make it possible for them to lie. Here is how the portrait of the cynical dictator is prepared for the cretins in the world of paid panic-mongers and unmitigated scoundrels. But all of this is really secondary. The point of the matter is that your world is drawing to an end. And you are such idiots that you are not aware of it. Because you don’t know The Tragedy of Man. But we are so good, merciful and liberal that you will have a place in the new world as well. At most you will have to quit lying. In exchange, you will be free too and, if you work, you CAN get something to eat. Scram! Bayer, one of the 37 founding members of Fidesz and one of the most prominent voices in the pro-government media, wrote the editorial in reference to the knife wounding of two athletes—Budapest MTK sports club boxer Gergő Sávoly and Szigetszentmiklós Sports Club wrestler Roland Gergő Bozsány—during a fight with Gypsies in the restroom of a night club in the village of Szigethalom, just south of Budapest, early on New Year’s Day morning. The year 2013 started with another Cozma affair. The only difference is that the victims are not internationally known athletes, but “only” top youth athletes. Whom the cowardly, disgusting, noxious animals knifed. The above sentence will be the cause of bogus indignation. Which is much easier, much more lucrative and generates more profit in the politically correct world than facing the facts. These are the facts: a significant portion of the Gypsy population is not fit for coexistence. It is not fit for living among people. These Gypsies are animals and behave as animals. They want to rut with whomever they see whenever and wherever they see them. If they meet with resistance, they kill. They relieve themselves whenever and wherever the need comes over them. If they feel they are being prevented from doing this, they kill. They want what they see. If they don’t get it immediately, they take it away and kill. These Gypsies are incapable of any kind of communication that could be called human. Most often inarticulate sounds surge forth from their animal skulls and the only thing they understand in this miserable world is violence. Meanwhile the half of the Gypsy population that has turned animal utilizes the “achievements” of the idiotic western world. Everybody take a look at how these “subsistence criminals” pose on Facebook with weapons in their hands, half-kilo golden necklaces around their necks and an “I’ll do you in at any moment, you stupid Hungarian peasant” expression on their faces. Take a look at the rat who stabbed Gergő Sávoly and his buddies on Facebook: you will see that all three of them are potential killers. Eo ipso killers. You don’t need to tolerate and understand, but retaliate. And it is here that the politically correct part of the idiotic western world commits its gravest sin. It pretends out of pure, calculating self-interest that these animals can be tolerated for any reason, that they are understandable, even admirable, as if they deserve any kind of respect and human dignity. And the most horrible thing about this whole nightmare is that in just a few moments they totally ruin the chances of the normal half of the Gypsy population. When Gergő Oláh won X-Factor, I thought well here, now you have it, what a beautiful and resounding answer the people gave to all the scoundrels who call Hungarians racist when they voted this talented, nice, modest Gypsy who movingly arose from the depths to become the contest’s winner. And I also thought that this extremely likeable Gypsy young man who emerged from the depths himself did more to alleviate the Gypsy-Hungarian conflict than all the “civil rights” scum bags put together. Then came New Year’s Eve and along came some forty rotten animal Gypsies, among them a certain János Jónás, and they set about killing. Because they couldn’t go immediately into the john when the need came over them. Because they would have had to wait for two minutes. Because. . . . There is no because. They did it because they are not people. Because they draw knives right away, even if there are forty of them, and stab. In the heart, often one time after another. Good Lord, how intolerable all this is, how it destroys everything that is human. And how there is no room here for excuses or tolerance of any kind! In fining Magyar Hírlap for publishing Who Should Not Be?, the Fidesz-appointed Media Council was following the letter of the law prohibiting hate speech in the Hungarian Media. However, the minimal size of the fine—one percent of the maximum 25 million forints in such cases—and the Orbán government’s steadfast refusal to distance itself from Bayer, one of its most loyal and influential supporters, causes one to wonder if the Media Council’s primary motive in imposing the penalty was not to punish the illegal dehumanization of Gypsies, but to provide itself with suitable grounds to rebuff charges of pro-Fidesz partisanship if in the future it takes such action against the opposition media.